Microloan and microenterprise programs have proven to be extremely effective ways to lift families out of poverty through self-sufficiency. 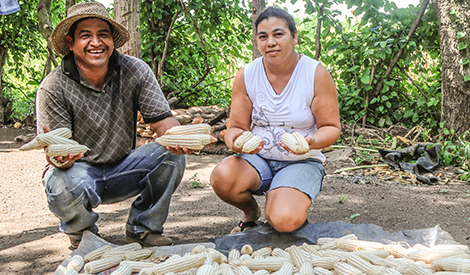 By giving a subsistence-level farmer seeds to plant and animals to raise, or giving a poor widow a microloan for a small, home-based business, we are able to give these people the capital they need to reach their potential. By overcoming their difficult circumstances and taking charge of their future, these men and women also regain their lost dignity. They enjoy stability and peace of mind as they provide for their families and have a positive impact on their local economy. In 2018, we continued our long-term partnership with Amigos for Christ in Nicaragua to provide microloans for aspiring entrepreneurs in Nicaragua, and also funded microloans for beneficiaries of Ambuya Development Center’s microenterprise project in Malawi. Amigos for Christ’s Microenterprise ministry helps poor families with an entrepreneurial spirit move from poverty to sustainability. Loans have a life cycle of five years, and each beneficiary has the potential to receive two loans per year. Each loan is awarded to a group acting as a cooperative, at a low interest rate. After each loan is repaid in full, the beneficiary can request another loan with the option to increase the loan amount. With these loans, the poor are doing more than surviving — they’re thriving! In 2018, 77 microloans were awarded to beneficiaries, for a total of $20,812. 116 adults and 232 children benefited from the program. Each loan recipient must open a savings account, in which he or she is required to deposit a portion of the profits generated by the investment. In total, 20 percent of the amount borrowed must be invested during the life cycle of the five-year term. Not only does Amigos for Christ empower entrepreneurs through economic development, but also it builds the community through clean water wells and sanitation, health care and education.